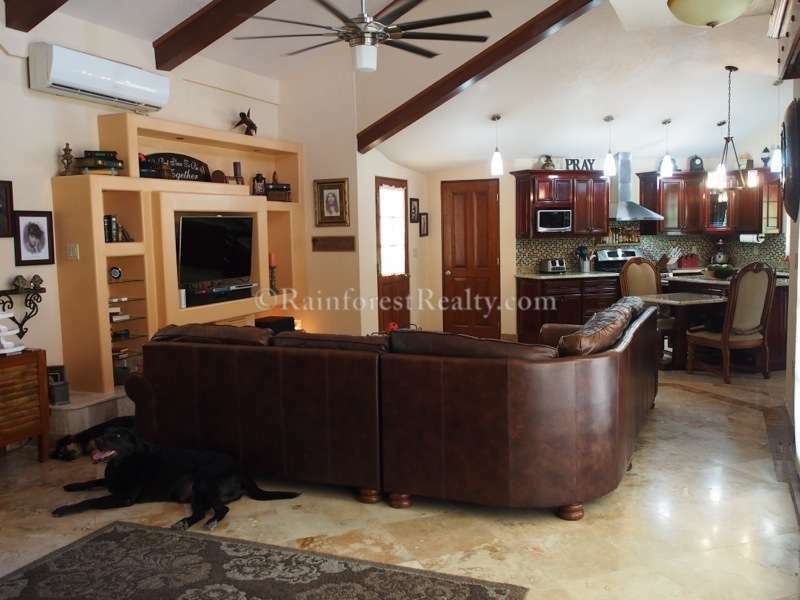 $ 495,000 USD : Living in Belize Luxury. Imaging yourself in the 4 bedroom 4 and a half bathroom Belize estate home located on the Macal River in Santa Elena Belize. Complete with a salt water infinity pool this home is a must see. Contact us for a showing. Living in Belize luxury is easy at this beautiful estate located in Santa Elena Cayo District of Belize. This estate is located on the East side of the Macal River close to the Hawksworth Bridge and the town of San Ignacio. It is less than 10 minutes to shopping and dining in San Ignacio and only 15 minutes to the Maya Flats Regional Airport. The entrance to the property provides safety and security with the entire Estate surrounded by a concrete fenced perimeter and electric gate. The magnificent tropical setting boasts a well constructed concrete home with a clay tile roof and welcoming paths leading around the entire property. The meticulous grounds boast a professional landscaping that provides a rich variety of fruit trees including bananas, coconut, mango, avocado and citrus. There is also a garden area that is ready for planting. The salt water infinity pool and jacuzzi tub are perched at the back of the house with a gorgeous view of the countryside. Charming outbuildings include a one bedroom guest suite with full bath, a two car garage, three car covered carport, utility room with sink, a storage room and an outdoor shower. 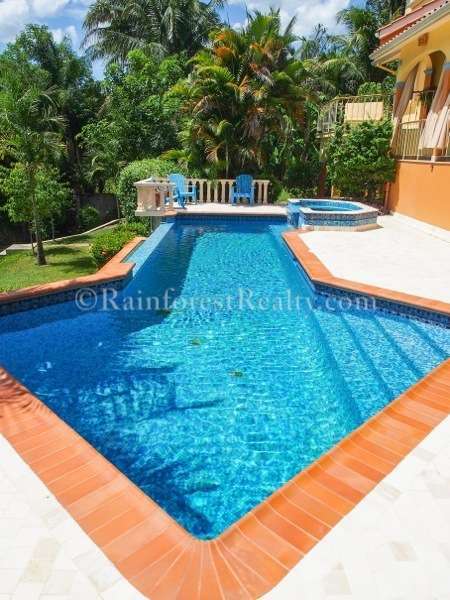 This magnificent home is a completely walled half acre tropical paradise on the banks of the Macal River. It features seclusion, tranquility and a manicured park-like landscape in a safe neighborhood. The four bedroom, four and a half bath compound is only five years old and offers plenty of room for family and guests. This indoor/outdoor all concrete tropical home boasts of several covered verandas at poolside and from the second floor balcony that overlooks the pool and Maya mountains. The residence provides plenty of space for outdoor entertaining. At the back and side, a wrap-around deck overlooks the private estate with views of the pool and jungle. The home features complete security cameras, a concrete water cistern, all tile floors, imported dual pane windows and air conditioners in every room. The inside of the home features a living room with a one of a kind contemporary entertainment center. The wall of high-efficiancy windows offers views of the grounds and pool. Light and airy, the kitchen is open to the living room and breakfast nook. The beautifully crafted mahogany cabinets have granite counter tops and all of the appliances are stainless steel. It contains a large refrigerator/freezer with drawers, dishwasher, propane dual stove and microwave. The kitchen also has a very large walk in pantry with shelves. The outdoor dining area is located on the second floor veranda and is overlooking the pool and the Maya mountains. The spacious master bedroom features a walk in closet, a master bath with walk in shower, jetted tub and his and hers sinks. Each of the other two bedrooms have their own private full bathrooms. 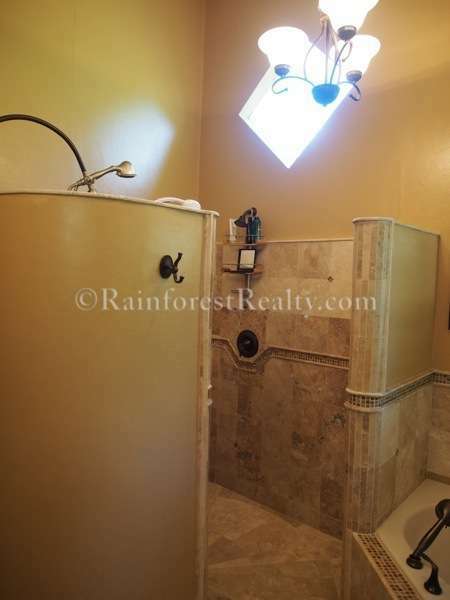 The fourth bedroom and bath are in a private suite detached from the main house. The half bath is located at pool level for ease and convenience. All of the floors are concrete with gorgeous tile. The furnishings can be included at a negotiated price.